The Audi A3 Sedan facelift has now arrived in Malaysia, with a sole 1.4 TFSI variant being offered for RM239,900 on-the-road without insurance (includes a five-year/unlimited mileage warranty). The A3 range was given a number of updates back in April 2016, which saw tweaks to its design and list of available equipment. 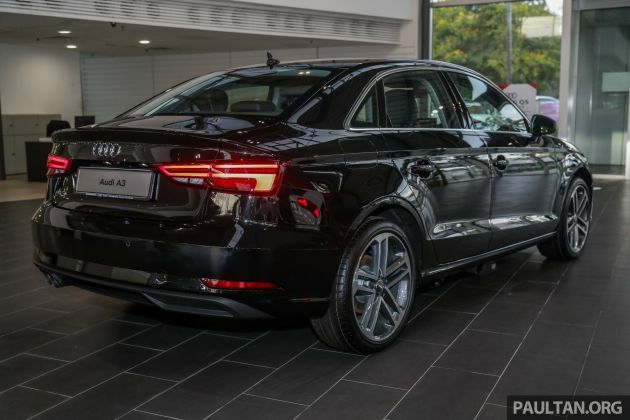 In the case of the former, the latest A3 is identified by its broader and sharper singleframe grille, which is flanked by reshaped LED headlamps that are reminiscent of those on the B9 A4 with a jagged bottom edge. At the rear, the LED taillights (with dynamic turn signal) carry redesigned graphics within them, and there’s a new bumper with more prominent lower inserts. Our cars come fitted with 18-inch five-double-spoke alloy wheels as standard, with 225/40 profile tyres to match. Moving inside, the changes are a little subtler, with a 12.3-inch Audi virtual cockpit instrument display being one of the highlights. Additionally, the retractable screen for the MMI Navigation plus infotainment system is now a seven-inch display with thinner bezels instead of the previous 5.8-inch unit. An eight-speaker sound system and MMI touch are the supporting equipment for the MMI system. Other items you’ll find inside include a dual-zone air-conditioning system with rear vents, a leather-wrapped three-spoke steering wheel, leather upholstery, power-adjustable front seats with four-way lumbar support, Micrometallic silver trim, a lighting package, Audi drive select, Comfort key, as well as keyless entry and start. Safety-wise, you’ll get six airbags, Electronic Stability Control and Isofix child seat anchors and top tethers for the outer rear seats. For convenience, there’s also parking aid plus with a rearview camera. Under the bonnet, there’s a 1.4 litre turbocharged four-cylinder petrol engine that serves up 150 hp from 5,000-6,000 rpm and 250 Nm of torque from 1,500-3,500 rpm. A seven-speed S tronic dual-clutch transmission handles power deliver to the front wheels, allowing for a zero to 100 km/h time of 8.2 seconds and a top speed of 224 km/h. The claimed combined fuel consumption here is 4.9 l/100 km, while CO2 emissions is rated at 114 g/km. The post Audi A3 Sedan facelift in M’sia – 1.4 TFSI from RM240k appeared first on Paul Tan's Automotive News. 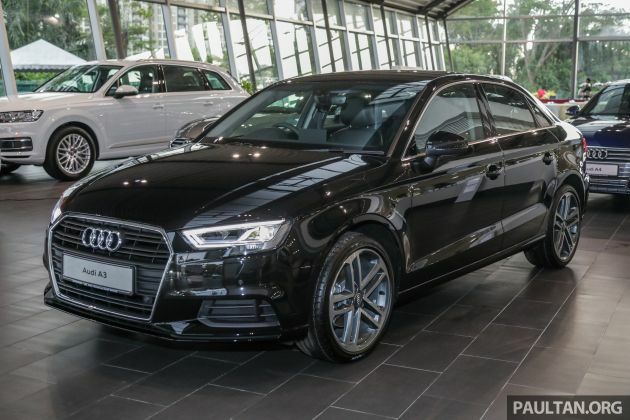 0 Response to "Audi A3 Sedan facelift in M’sia – 1.4 TFSI from RM240k"